I was a big fan of A Cappella Soul 1, which was mostly songs from Sheves Chaverim and Sheves Achim with a handful of new tracks. 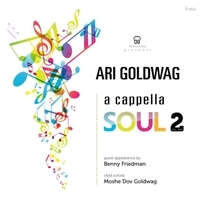 It took the vocals from the songs we all know and Ari Goldwag made the “music” using his voice. The album quickly became one of my sefira favorites and for good reason. Needless to say I was excited when I heard A Cappella Soul 2 was coming out, and I haven’t been disappointed! This album, however, is quite different from the previous one. There are no Sheves Chaverim or Sheves Achim songs (a little disappointed because I would lovean a cappella Sof Dvar! ), but there are a lot of Ari Goldwag favorites, new songs, and appearances by Moshe Dov Goldwag as well. It’s great to hear a lot from Moshe Dov on the album, just listening to him sing makes you smile. 1. Borchu (new song, featuring Moshe Dov Goldwag) Musically, I love few things more than a father and son singing together. The album starts out with “Borchu” which not only stars Moshe Dov, who we saw on Sheves Chaverim, the song “Aleinu”, dancing in the “Am Echad” video, etc., but it was also composed by the father and son together. This is a laid back catchy song that makes you want to clap along. Moshe Dov’s voice keeps getting better and better. He still sounds very young (and therefore sweet!) but has great control. Love the ending! 2. Aishes Chayil (from Simcha B’libi) Ari Goldwag composes the most gorgeous slow songs. This is no exception and is a beautiful tribute to his wife. He sings with such heart! I love the harmonizing that starts around 2:55 and 3:40. 3. Am Echad (from Am Echad) It’s an acapella version of the hit song we all love! This is interesting, because it doesn’t really lend itself to acapella the way that a very slow song like Aishes Chayil does. But it works! The “music” is kept very simple. As for the song itself, for those of you who don’t know it, it’s a fun Israeli-style song with a great message about togetherness. If you haven’t heard it, you should, and if you haven’t seen the video, check it out as soon as you are able (I keep the second half of sefira…). 4. Hinei Ma Tov (new song) I love this song! It seems like it was made for acapella, (but I hope to see it with music at some point). It’s beautiful and heart-warming and full of simcha. I can’t say enough about it- it’s just an excellent song that really shows off Ari Goldwag’s voice . I want to listen again and again. It’s a slow-ish song, but still upbeat. 5. Shallow Waters (from Lishuascha Kivinu) This is one of two English songs on the album. Like all of his English songs, this one has a message we can all benefit from. It’s a very fast catchy song and although I don’t usually love English songs (even on Ari Goldwag albums, I like them , but always prefer the Hebrew ones), this is definitely a keeper. 6. Min Hameitzar (from Am Echad, featuring Benny Friedman) Well, anyone who heard the original of this song knows that it is gorgeous as acapella and works perfectly. It’s incredible how much feeling Ari Goldwag always puts into his songs, and this track is no different. Ari Goldwag and Benny Friedman make a great duo. This song is heart wrenching. Someone who doesn’t know Hebrew would likely be able to figure out the message here! This song is absolutely incredible. I think I might even like it better as acapella. 7. Nodeh (from Am Echad, featuring Moshe Dov Goldwag) This fun song was one of my favorites on Am Echad and also features Moshe Dov Goldwag. At around 3:00 there’s a new interlude that we didn’t see in the original version. This song is also Israeli style. 8. Zeh Hazman (new song) Another upbeat, clap your hands kind of track. Zeh Hazman has an Israeli flavor interspersed with simple English lyrics– “Treating our friends as we’d want in return. This is the lesson it’s the time to learn. Now’s the time to refine ourselves in the days of sefira”– the same message but not a direct translation of the Hebrew lyrics. I absolutely love this song. I would say I hope that it ends up on another album with a music version but that wouldn’t make sense! It’s a great positive way to take the sefira seriously! 9. Ribono (originally composed for the Chofetz Chaim Heritage Foundation and recorded by Shea Rubenstein) I have never heard this song before, and like virtually all other Ari Goldwag slow songs, it’s beautiful and full of emotion. The lyrics are taken from what we say after Shemoneh Esrei asking Hashem to keep us from speaking Lashon Hara. Perfect for this album and time of year, and frankly perfect for anytime! When Ari Goldwag sings- especially in the last 90 seconds of this song- he sounds like he is davening, literally talking to Hashem. 10. I’m Imperfect (originally form Am Echad) The video for this song was just released so if you haven’t seen it yet, check it out. This is a humorous song talking about how we are all imperfect but can still strive to be our best. I really enjoyed this song on Am Echad and the acapella version is great too. It’s upbeat and has a jazzy feel. I think it’s important an somewhat unusual to see a humorous song with a deep message aimed at adults. I’m not a huge fan of English songs this is not my favorite song on the album, but it’s good. 11. Shalom Aleichem & Yesh Tikvah Medley (originally recorded by Benny Friedman) Great things always come when these two stars work together, and these songs released by Benny Friedman are two prime examples. It’s nice to hear them done by Ari Goldwag, though– especially with the appearance of Moshe Dov Goldwag throughout. I’ve said this before– I love it when the child soloist doesn’t just come in for a few seconds and sing a line but is featured throughout the song, as is done here– in both Shalom Aleichem and Yesh Tikvah. –Conclusion– If you are an Ari Goldwag fan, someone who needs a good album during sefira, or just a music lover in general, I would recommend giving this album a listen. It’s got a great mix of songs and all are high quality.